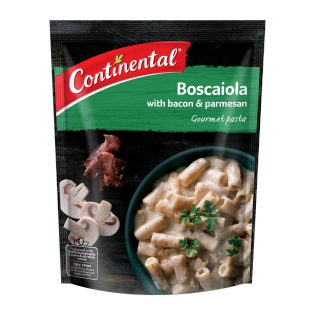 This Boscaiola With Bacon & Parmesan Pasta contains real bacon, mushroom and parmesan cheese, combined into a creamy and earthy Italian classic. Create your own twist by stirring through some cooked chicken and peas. Before serving sprinkle with chopped parsley and shaved parmesan. Pasta (80%) [wheat^ flour, colour (carotene)], natural flavours (contain milk), maltodextrin, starch (potato, corn), vegetables [onion powder, mushroom (0.9%) (dice, extract), garlic powder], cheese powders [parmesan (1%), mozzarella, blue cheese, cheddar], mineral salts (451,452,508), yeast extarct, bacon (0.8%), sugar, sunflower oil, salt, parsley, hydrolysed soy protein, black pepper, food acid (lactic), colour (carmine). ^From responsibly grown wheat. Contains naturally occurring glutamates. Allergens:Contains wheat,milk and soybean products. Blended on equipment that also processes products containing peanut, egg, sesame, fish and crustacea. Stove Top- for best results 1) Bring 3/4 cup (190mL) milk, 1 cup (250mL) hot water, 1 teaspoon Flora Salt Reduced spread and Pasta pack contents to the boil,stirring. 2) Simmer, uncovered for 14 minutes, stirring regularly until sauce thickens and pasta is cooked. Microwave(900W) - cooking times may vary 1) Combine 3/4 cup (190mL) milk, 1 1/2 cups (375mL) hot water, 1 teaspoon Flora Salt Reduced spread and pasta pack contents in a microwave safe bowl. 2) Cook uncovered on HIGH for 14-16 minutes, stirring 2-3 times.Stand for 2 minutes before serving. FOR A COMPLETE MEAL... Just stir through some sliced cooked chicken, peas and sprinkle with chopped parsley. i had nothing for dinner - cooked this threw some cooked diced chicken in and voila!! its now a favourite with everyone even cooked it for VISITORS and they thought it was DELICIOUS too!